LDT Dosiertechnik’s RAPIDA motor inverter system. The RAPIDA system offers users an easy way to vary the flow rate of the DOSEURO pump range, making them more versatile for many applications. 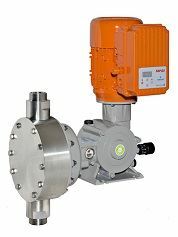 The motor frequency of the RAPIDA system can be varied between 6 and 60 Hz to give a proportional flow rate of between 10 and 100% of pump capacity. The frequency can be set either locally at the motor via an integrated LCD display or remotely using a 4-20mA signal. The local display can be set to show motor frequency in either % or Hz. The RAPIDA motor inverter system is available with SR type A, D, B, BR and SD DOSEURO pumps. The unit can also be easily retrofitted on site for existing pump installations. The unit offers real benefit and versatility for use in many different applications and is a welcome addition to the LDT Dosiertechnik solutions portfolio. German dosing pump specialist LDT Dosiertechnik GmbH has moved to a new facility in Hamburg with a larger workshop area and extended storage capacity.